Above: Colorized version of a sketch of Hart Island done in 1865 when its use as an army camp was winding down. Click to access. Enlarge. Use browser's "back" button to return. 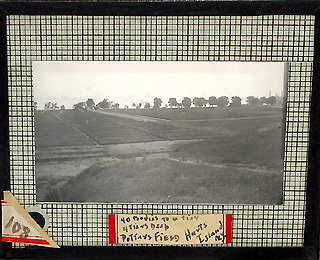 Vintage Hart Island photo glass slide as displayed on eBay, purchased and sent to NYCHS by Bob Ballatine. The actual photo portion of the glass slide is 3 inches wide by 1.75 inches. Click image to access NYCHS web page about it. Use your browser's "back" button to return. As you are aware from our interaction a while back relative to the mystery glass slide of Potter's Field, I frequent the eBay web site. Among the offerings I keep watch for are any involving Hart Island history. I became interested in the island's history beause its warden for many years, Ed Dros, was a ham radio operator. But more on that later . . . . Recently I have seen offered on eBay an etching of Hart Island when the U.S. Army used the place as a rendezvous point and training base during the Civil War and as a mustering out camp during the immediate post war period. Two versions of the etching have been offered: one colorized, one not. I send along images of both. The scene sketched raises in my mind a lot of questions as to its accuracy. I look at that etching and wonder why the island is depicted so high above sea (river) level. Could the place have been bulldozed so many times since 1865 that it has been flattened somewhat? Captain Wilson Barstow (graphic pen sketch above), an aide-de-camp to Gen. John A. Dix (Brady photo below), had charge of Hart Island mustering-out operations. Click on the Dix image for another page on this web site that includes a Dix image. Use browser's "back" button to return. Once again NYCHS has cause to thank you. The last time the reason was your generous gift of the "mystery glass slide of Hart Island." This time the reason is your thoughtfully sending us digital images of two versions (one colorized, one not) of an 1865 sketch of the island then in use as an army base. The 31st U.S. Colored Troops regiment, that had mustered in on Hart Island during April 1864 under the command of Colonel Henry C. Ward, mustered out in November of 1865. It had been active in a number of battles in Virginia, including the siege of Petersburg, and was at Appomattox before, during and after the Confederate surrender on April 9, 1865. The 31st USCT was one of several Hart-trained Union military units active in the field during the year that the sketch was done. The digital image of the colorized version appears at the top of this web page. NYCHS used the exact words of the sketch's caption -- Hart Island, Near New York, A Station for the Disbandment of the Federal Army -- to conduct research into the drawing's origin. It originated as illustration in the August 12, 1865 issue of The Illustrated London News (vol. 47, no. 1328, p. 128). HART ISLAND, NEAR NEW YORK. Among the signs of returning peace most satisfactory to the observer of affairs in America during the last two or three months was the disbandment, or, as it is there termed, the "mustering out," of the various regiments composing the armies of the United States. One of the stations appointed for this purpose was at Hart Island, situated at the head of Long Island Sound, about twenty miles from the city of New York. Since the early days of the war Hart Island had been used as a general dépôt for recruits, a purpose for which it was admirably adapted by its healthful situation. Our Correspondent visited the place some weeks ago, on the invitation of Captain Barstow, Aide-de-Camp of General Dix's Staff, who was the officer in charge of the arrangements for mustering-out troops at this post, and had a fast-going steamer at his command. The sketch of Hart Island which we have engraved was taken from David's Island, which lies at a short distance from it, and is also a dépôt for troops. An uncolorized version of the illustration, accompanied by the above text and headline, appears on the web site of the Lewis H. Beck Center, Woodruff Library, Emory University, Atlanta, Georgia, as part of its "The Civil War in America from the Illustrated London News" project. Emory University grants non-profit educational internet sites such as correctionhistory.org permission to copy and post its scanned image of the printed illustration provided that appropriate source acknowledgment and credit is given. The copy of the 1865 uncolorized sketch of Hart Island that can be accessed from this NYCHS site by clicking either image detail near the top of this page is available through the courtesy of The Civil War in America from the Illustrated London News: A Joint Project by Sandra J. Still, Emily E. Katt, Collection Management, and the Beck Center of Emory University. That's why clicking either detail image near the top of this NYCHS page can access that uncolorized version of the illustration. NYCHS research indicates that the officer referenced in the Illustrated London News story as overseeing Hart musterings-out was Wilson Barstow, born circa 1830-31 in Mattapoisett, Mass., where the family name has been prominent in the area's history. He was the first cousin of General Simon F. Barstow. Wilson Barstow was commissioned second lieutenant with the 37th New York Infantry on Sept. 28, 1861. 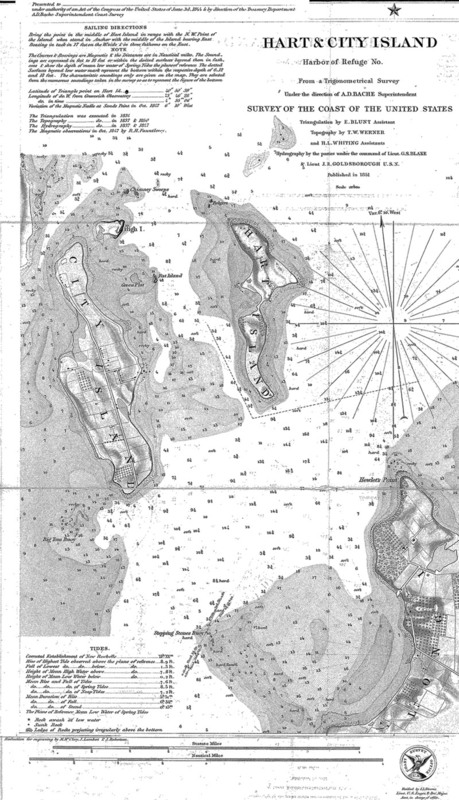 Above is a detail from an 1851 coastal survey map showing why one of Hart Island's early names was Spectacle Island, featuring two land areas linked by a narrow isthmus. Note the small island north of Hart lies along a NNE line that passes through David's Island futher north. The Illustrated London News artist on David's Island sketching Hart would have seen little of its lower-lying southern part. This may have contributed to the highland look to the drawing. NYCHS thanks Bronx history researcher Jorge Santiago for sharing an image of the 1851 map from which the detail was extracted. Click above detail to access an 11x19-inches version of the map. Enlarge. Use your browser's "back" button to return. Below is a modern aerial view of Hart showing how landfill modified the island's shape, eliminating the isthmus and the Spectacle look. Parts of the original "high ground" may have been used as "fill." Made a captain and aide-de-camp to Gen. John A. Dix on June 20, 1862, he became chief commissary of musters of the Department of the East. On March 13th, 1865, Barstow was brevetted a Brigadier-General. After his own mustering out, he was appointed assistant appraiser for the Port of New York under Thomas McElrath. Wilson Barstow died in NYC March 16, 1869 at about 39 years of age. In that same year, his former commanding general, Dix, at age 71, was completing his service as U.S. Minister to France, a post to which he had been appointed in 1866. The retired general, who had been elected to the U.S. Senate from New York as a Democrat, serving 1845 -1849, would be elected governor as a Republican, serving 1873-1874. As for the "high" look of the island in the Illustrated London News, I agree with your questioning the accuracy of the artist's rendition. I would not have recognized this 1865 illustration as depicting Hart Island. Much landfilling took place in the 19th Century to widen the narrow strip that joined the north and south parts of the island. One of the old map names for what is now known only as Hart Island was "Spectacle Island" because its configuration -- two land areas linked by a thin isthmus -- resembled eyeglasses. The northern portion of the island was its higher end; the southern portion was much more low lying. Some of the hill on the north side of the island may have been removed to fill in and fill out the isthus. So the sketch was a "before" landfilling/earth-moving view of the island. 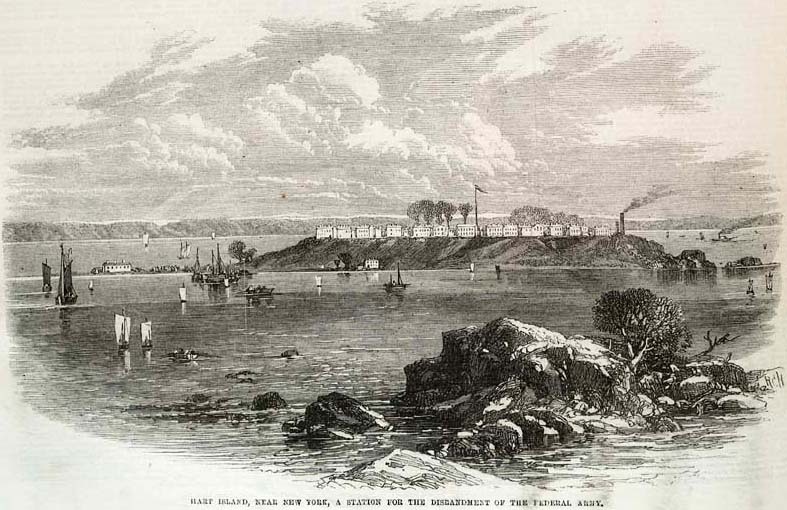 The text accompanying the Illustrated London News sketch stated that the view was Hart Island as seen from David's Island. The latter lies north of the former so that quite possibly little of Hart's low-lying southern portion was visible to the illustrator looking from David's. The year of the Hart Island illustration -- 1865 -- saw that Union military camp transition from a mustering-in and training facility to a mustering-out and Prisoner-of-War facility. From April to July about four acres of the island served as a POW confinement area holding as many as 3,413. Conditions were so bad that 235 prisoners died with those few months. For more on that horror, read NYCHS' presentation of excerpts from Portals to Hell: Military Prisons of the Civil War by Lonnie R. Speer. Click tumbnail image of its cover (above, left) to access. Use your browser's "back" button to return. During the Civil War, Hart Island saw the presence, in one form or another, of at least three dozen Union military units. Some mustered in and trained there. Later some mustered out from there. Others had more or less permanent assignments such as guard duty, recruitment and training work. The following list reflects the units that NYCHS research indicates had Union troops active on the island during 1865, the year the Illustrated London News sketch was done. In some cases, an entry is based on the reported presence there of one or more known individuals from a particular unit. The presence of others from that same unit may be considered a reasonable probability, but not an absolute certainty. 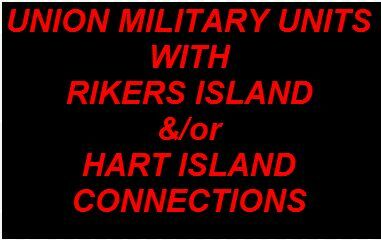 For more about Union military unit presences on Rikers and Hart Islands visit the NYCHS research charts elsewhere on this web site. Click that presentation's icon image (above, left). Use your browser's "back" button to return. 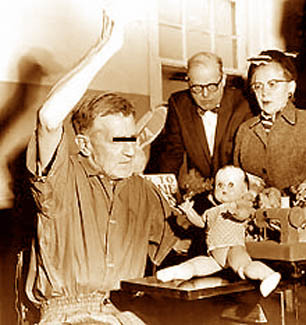 Warden Edward Dros and Correction Commissioner Anna M. Kross observe elderly inmate sew a doll at Hart Island shop repairing toys for needy children circa 1960. 190th NYSV . . .
muster in, muster out . . .
in: April 7, 1865. out: May 3 and 4, 1865. 194th Infantry . . .
muster in & out . . .
in 1865: Co. C, D, E, F & H April 7th, 16th, 22d, 26th and 27th, respectively . . .
mustered out in May 1865. 25th Calvary Sickles' Cavalry . . .
1864 in: Co. G Apr. 20, H July 29, I Sept. 18 . . .
K May 16, L & M Oct. 15 & 20, 1864. out: June 27, 1865. 31st U.S. Colored Troops . . .
muster in, out . . .
in: April 29, 1864 . . . The Hart Island beach scene image above and the the two Hart Isand warden residence images below accompanied the following communication from Bob Ballantine. Click beach scene for larger version. Enlarge. Use browser's "back" button to return. Ed Dros, long-time Hart Island warden, was an avid radio "ham" and quite active in the Bronx [Amateur] Radio Club. 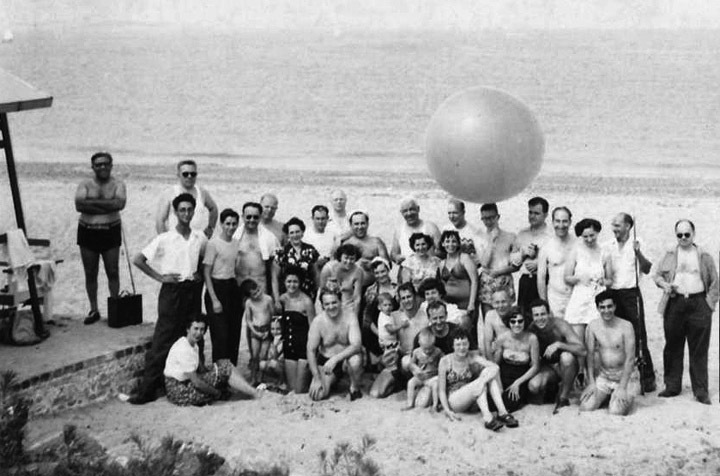 Occasionally during the 1950s, he hosted outings for club members on the island's beach facing Long Island Sound. In the accompanying photo of the group, the club members were operating a ham radio and the (weather) Pilot Balloon in the pix held the antenna cable. I think the warden is the sixth man standing on the left. The photo comes from former club member, NYPD retiree Lenny Mendel (K5OVC), now living in Ark.,who recalls that he learned on Hart Island how to ride a motorcycle -- thanks to the warden. 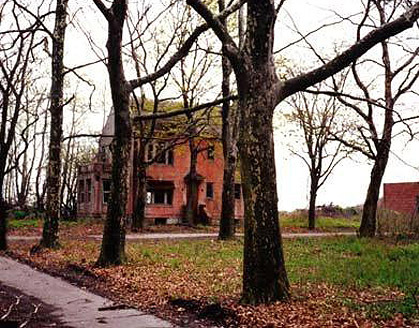 I also am sending along two images of what I believe served as the Hart Island warden's home (red brick) during Dros' tenure. 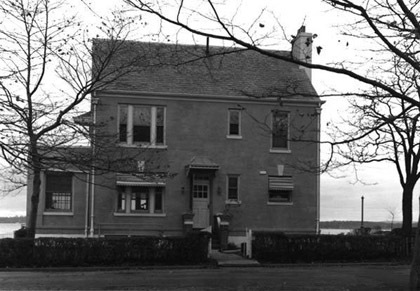 His antenna pole was in the back yard.The black-and-white photo shows the house in an era when it was still in use. The color photo shows the deterioration from recent decades of disuse. 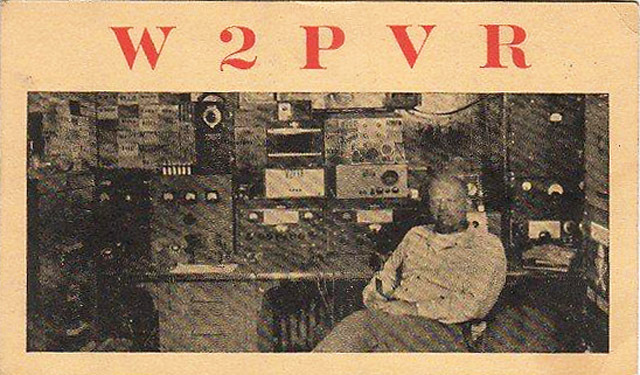 Dros was a long time ham radio operator, starting when he was in the U.S. Navy. He also served in the the Coast Guard as did I. He and I had the same rating, Radioman. He retired to Florida and died there in 1978. 15th NY Cavalry Red Neck Ties . . .
individual presence . . .
Pvt. 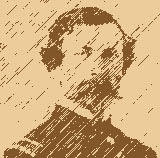 John Gracey joined Feb. 2, 1864 . . .
mustered out May 8, 1865. 143rd Pa Vols . . .
unit presence . . .
guard duty at the camp of rendezvous & later the prison camp . . .
mustered out: Feb. 11 - June 12, 1865. 191st Infantry . . .
in, 3/30/65 - 4/28/65 . . .
136th NY Infantry . . .
Michael Annis, enlisted Ap 13, 1865 at Rochester . . . Discharged month later, May 14, on Hart. 63rd Ohio Vol. Inf . . . Individual reports on Privates John Breese, Amos Tong, & Stephen Dougherty have each mustering out on May 15, 1865 . . . The Dougherty report notes "he mustered out with his detachment." 68th Pennsylvania Infantry . . .
April to June 1865 . . . guarding POWs until June . . .
Mustered out June 9, 1865. 22nd Cavalry Rochester Cavalry . . .
muster out . . .
Ed Dros's ham operator call letter card images above and below accompanied the following communication from Bob Ballantine. Click an image for larger version. Use browser's "back" button to return. 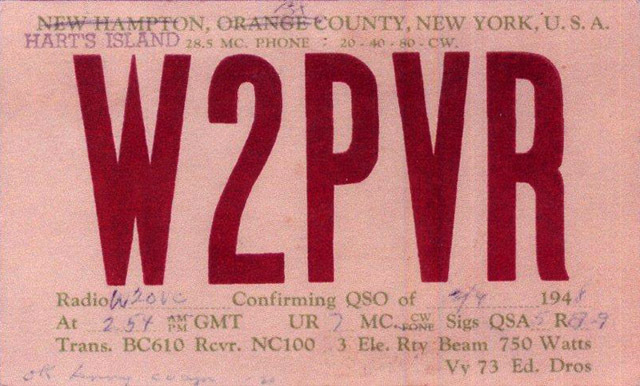 Ham operators are fond of exchanging and collecting call letter cards with those whom they have contacted via radio waves. I've got two of Hart Island Warden Ed Dros' call letter cards. I will send you images of them and you can decide which to use or to use both. I believe Warden Dros sent out the picture-less card from his residence on Hart Island in 1948 sometime after having moved there from the DOC facility in Orange County, N.Y., the NYC Reformatory at New Hampton. Note the cross-outs and the penned and typed insertions at the top of the card. The other card has a picture of his station and himself, probably sent from City Island . NYPD retiree Lenny Mendel (K5OVC) shared both these cards with me. 75th Ohio Volunteer Inf . . .
Pvt. Albert W. Simmons, 18, mustered out May 15, 1865. 10th Inf. Michigan . . .
Pvt. James R Toms, who joined April 11, 1865, was discharged May 16,1865. 119th N.Y. Inf. Co. H Willis Co. . . .
69th Infantry Irish Brigade . . .
muster out July 2, 1865. 40th Infantry Mozart Regiment . . .
6th Independent Battery First Excelsior Light Artillery . . .
7th Veteran NYSV . . .
5th Veteran NYSV 1st Excelsior Light Artillery . . .
56th NY Veteran Vol. Inf . . .
John Metcalf of Goshen who joined Aug. 16, 1861, as a private, mustered out March 5, 1866, as Company A Captain. 54th Infantry Regiment Hiram Barney Rifles; Barney Black Rifles; . . .
Schwarze Yaeger muster out April 14, 1866. The above aerial image accompanied the following communication from Bob Ballantine. Click image for larger version. Enlarge. Use browser's "back" button to return. This is a '40s aerial shot of Hart. Is the landing wharf top left still in use? I was wondering if they continued to use that spot over the years for the ferry boat to enter Hart. Or do they use another landing these days? Unfortunately the image you sent cuts off the ferry slip then in use although you can make out the ramp's metal arches. The current ferry slip and ramp are located in the same spot. However, the rest of the warf is gone. Again thanks for all your Hart Island/Ed Dros information and images. 13th Conn. Regiment . . .
paid, disbanded May 5-7, 1866, after 4 years, 5 months, 8 days in service. 107th NYS Vol. Infantry organized in Elmira . . .
4 who joined it earlier in 1865 mustered out May & June 1865. The many structures depicted on Hart Island in the Illustrated London News sketch figured in the Public Charities and Correction Commissioners' decision to acquire the isle. 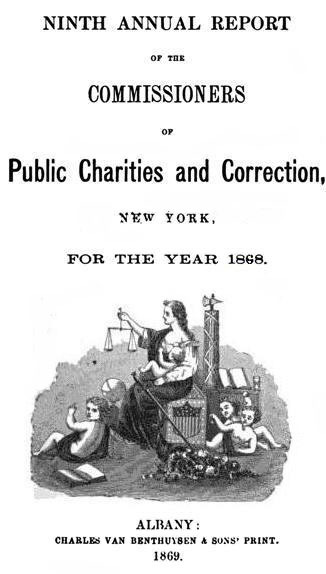 Pages 27 -29 of "The Annual Report of the Commissioners of Public Charities and Correction, New York, for the Year 1868," published in 1869 and printed by Charles Van Benthuysen & Sons, provide some of those Hart Island acquisition details under the subtitle "Reformatory School:"
Above is an image of the cover of the 1868 annual report of the NYC Public Charities and Correction Commissioners. In it they describe the purchase of Hart Island for burial grounds purposes and their plans and actions to use the island for a reformatory. For the full text regarding the Hart Island acquisition, click the cover image to access a web page with the full excerpt in a separate presentation elsewhere on this site. Use your browser's "back" button to return. By an act, passed at the last session of the Legislature, the Commissioners were authorized to buy land for a public cemetery. The most eligible grounds in the vicinity of New York for this purpose were found on Hart's Island, distant about fifteen miles from the city . . . . The island contains about one hundred acres. It was occupied during the rebellion by United States troops, and a portion of it is covered with barracks and officers' quarters. The Commissioners purchased the island . . . with all the buildings, from John Hunter, Esq., for seventy-five thousand dollars. The sum expended by the government for the buildings is understood to have been $210,000. The officers' quarters and several other buildings, twenty-five in number, are in good order and well adapted for the purpose to which the Commissioners have applied them, the foundation of a Reformatory School. Their value is estimated at $40,000. Besides these buildings, there are many others in a dilapidated condition, but the timber of which is sound and can be used in the construction and repair of other buildings. The value of the timber is estimated, from actual measurement, at $28,600. . . .
With the view . 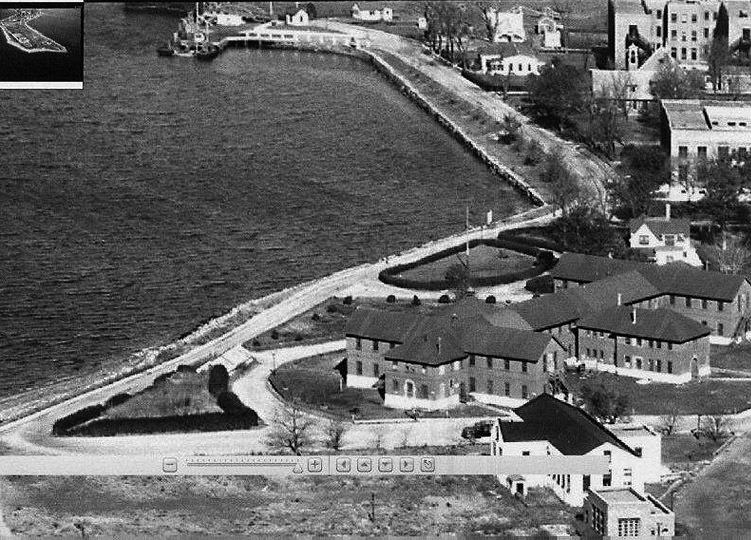 . . of providing a Reformatory for vicious children, the Commissioners have fitted up several of the houses on Hart's Island for school rooms and dormitories. About sixty boys have been collected. . . .
As you can see from the above information incorporated into this response to your thoughtful sharing of the Illustrated London News sketch, a considerable amount of history is associated with the illustration. So we thank you for both sending us images of the illustration and, as a consequence, prompting us to trace its historical connections.